One of the common problems JotForm users encounter is to send newsletter emails to people who previously filled their forms. 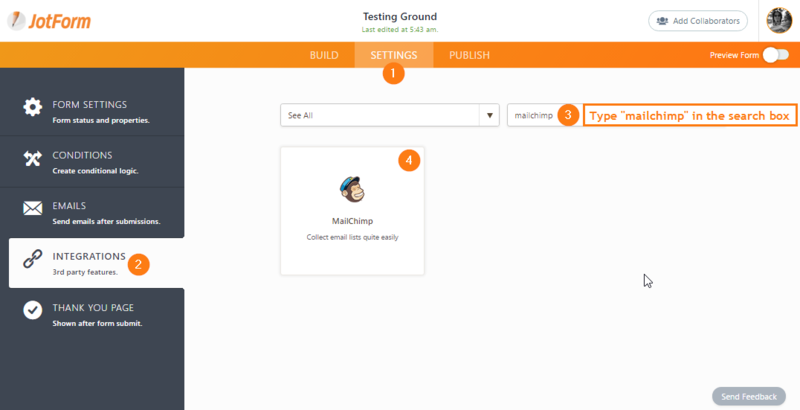 There are really great tools to send emails, and one of them is MailChimp. 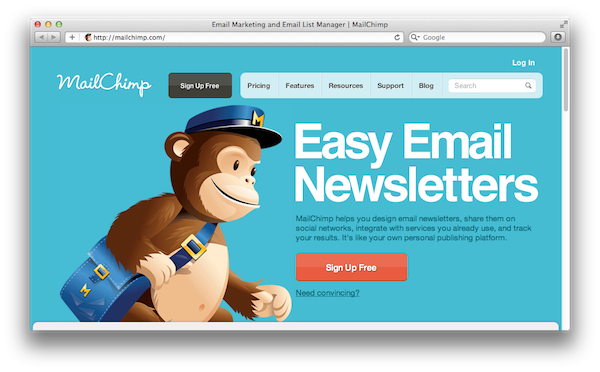 Mailchimp is a great tool to send beautiful newsletters or announcements to your web site users and customers. So, instead of implementing a newsletter feature ourselves, we decided to integrate with them. So, how can you start using MailChimp integration? Easy! 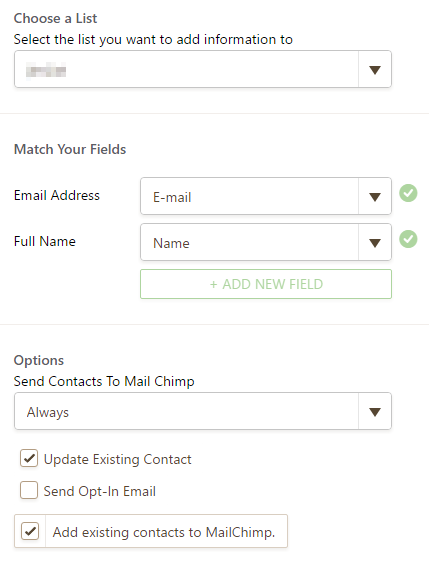 Since Name and Email fields are required in the MailChimp list, please make sure that you are having Name and Email fields on the form before integrating MailChimp. 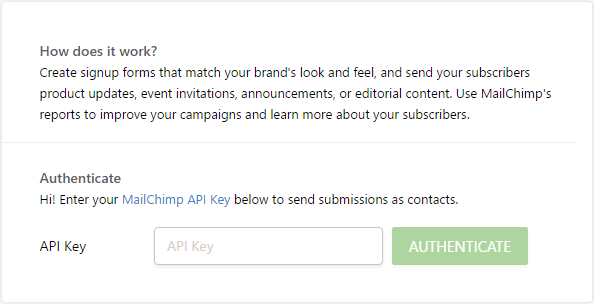 Connect your MailChimp account by clicking the Authenticate button and logging into your MailChimp account. Then follow the wizard steps. One of the great things about our MailChimp integration is that it can add your existing submissions data to your newsletter list. So, in minutes, you will be ready to send newsletters to your visitors. See the following screenshot. You can also setup to send the information directly to an Opt-in mail. Allow the user to decide if she wants to be added to the Opt-in list by using a Send if user agrees, so this will work if a check box into the form is ticked. MailChimp is free up to 2,000 subscribers. So, even if you don’t have an existing account, you should give them a try. Send your users a newsletter and remind them about your web site. You said go to settings at the top. At the top of where? Where does the integration start, in wordpress or in mailchimp? And are these instructions for an embedded form which I can have on my wordpress blog posts? Is it possible to have two different embedded mailchimp signups that go to different lists? ie. We want people to sign up for a marketing email as well as an IT email. These are two different lists being signed up from the same Jotform. Hi, I think I am almost there. I have followed the instructions and have got both Name and Email fields on the form as shown. However, there seems to be a piece of missing information - we have the integration API for Mailchimp, but don't know where to put it when in Mailchimp? So where does this go? I can see html code for the form embed for a website - but we don't want to do that - we need to get the form in an email and send it out to people. Please can you give us some more info? Is it possible to add an email address to a list depending on an answer to question on the form? I have Integrated Mailchimp into my form but my list isnt picking up all of the information. Only the name and the email adresse ist being sent to my mailchimp account. Is this a flaw of the integration or a problem with mailchimp? I just realised I have the same problem as amsoulsby and holistic beauty below. I have already attempted to incorporate Mailchimp. "Since Name and Email fields are required in the MailChimp list, please make sure that you are having Name and Email fields on the form before integrating MailChimp." It wont let me add this and I proceed without entering an email. Can you add some instructions regarding this to the guide? I have MailChimp sending an opt-in email. If I select it on Jotform as well, are people going to receive multiple opt-in emails? I have everything integrated but when I don't know which code to embed directly onto my webpage, as in, not the pop up, but a form I would like to place at the bottom of some of my pages. Is it embed, source, Iframe? When I used the embed all that showed up on my page was a link to the form and not the form itself, unless that is what is supposed to happen, which I do not think the case. My integration with mailchimp worked until Dec 27, 2017 when I stopped getting new submissions in MailChimp. I've checked the integration and everything in jotform says it is working properly but I'm still missing this week's submissions on mailchimp. Any ideas? Integration with MailChimp was successful and Jotform submission successfully populated email and name fields in MailChimp list. However, address field was not populated. Integration menu recognized "Address" from MailChimp and "Home address" from Jotform form, but field was not populated. Neither is a required field, but was filled out in submission. Hi, Im having the same problems as amsoulsby, the drop down box isnt giving me a option and I can find the solution anywhere. I have set it up and has been working well, but now i see i have 800+ forms but only 600 are linking over. dose mail chimp have a limit? 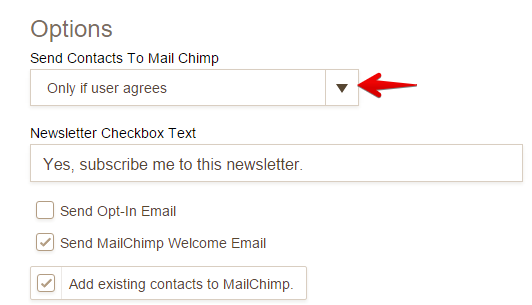 An optional check box in my JotForm is linked up with a field in my MailChimp list. This field might already be populated in MailChimp – a user may have filled in the form at previously – and I need this information to stay intact. But if the check box in my JotForm is left unticked... this will overwrite the MailChimp field with a blank entry – thus deleting any existing information. This is a problem. Please tell me if there is a way the field could be left intact if the check box is not ticked? thanks, this did the trick. Is it possible to embed the sign-up form into the sidebar, or footer - via a widget? I've tried copying the [embed] HTML code into a text widget, but it won't appear on my website. I have done every step as above, so now how do i intergrate the form into wordpress blog? With each new form you create, do you need to integrate mailchimp each time? How to integrate MailChimp for android .Kindly help me and give some doc or tutorial. Does the opt in checkbox have to be labeled "Newsletter"? and can the text be edited? - My conditional set up in integrations keeps dropping out the opt in? i've got the integration working, nice!! But now I added some fields in my form, but I don't know how to enter the mailchimp integration tool again. This is absolutely rubbish and a complete waste of time. Will only let you have 3 fields to import. After I put in my Mail Chimp API, it asks me to select a list, but none of my lists are shown in the drop down menu (it's empty). If I click NEXT, it redirects me to select a list first, which is still empty. I have like 10-15 Mail Chimp lists...why don't they show up when I try to integrate them? i m facing issue which i have attached with link plz help me out asap. Hi, I am trying to integrate my jot form with Mail Chimp but when I get to the window where I need assign the mail to the mail etc it just gives me blanks options? Hi, I've not had a lot of success with integration with mailchimp. I've done all of the above steps but no data gets sent to the mailchimp list. I have folloewd your steps but after jot form submited no subscriber add in mailchimp list. I am looking for a way to send jotform data to an email marketing or newletter, not a list. Is this possible? I need to send automatized emails for new subscribers and I´d like create list directly from the form. Example Subscriber complete a form and he or she receives emails with information that it was prepared before, its like an autoresponders emails but extend this process in a specif time interval (1 mounth: 1 Email per week)for each new subscribers. The 'Add New Option' doesn't allow other name and email to be chosen to add to Mailchimp. How can I fix that? I have coompleted the intergration process but I can't seem to get the first and last names to populate in the appropriate fields in Mailchimp. How do i correct this problem without changing my JotForm documnent? Is it possible to have the end user choose which Group they wish to subscribe to? This seems like such a logical feature. In a world where there are people who like bananas or apples, we should allow them to choose which types of emails they are interested in: Banana Emails or Apple Emails instead of forcing them into one. I am not seeing my contacts go into Mailchimp. I have my API key from Mail chimp, but nothing is flowing through? I have no a Mailchimp List with 3 "Subgroups". When I start the Mailchimp Integration Wizard I can see the List and the 3 groups. The customer should be able to select also the group in the Jot form. The selected group(s) should then submitted to mailchimp. that should have said "and select the correct list". The integration is not working for me. I select Mailchimp, enter the API key etc and select the correct. Then I test the Jotform form - check the opt-in field but the entry does not appear in my Mailchimp email list. jotform 'select list' won't work uggh anyone? but when I just want to import from jot to chimp the PICK A LIST is grey and not enabled? So I love the JotForm system for forms but I want to be able to wrap it into a newsletter. Can I embed the JotForm into MailChimp so that way I can put additional featured information around the JotForm? If I want to only have those submissions who opt in by checking a checkbox to be entered into mailchimp database, how I can I integrate that conditionally? I need to create multiple sign up forms that go onto one mailchimp list- but there's one catch. Each form needs to go into the same list but a different group of that list. Is it possible to add a group field on mailchimp forms? How can I add a checkbox to confirm users want to sign up for a newsletter? How can I send out newsletters from my Mailchimp list while it's integrated with JotForm? I have MailChimp sending an opt-in email. Why is my mailchimp integration not working? The integration is not working for me.